The three sacred mountains of Dewa, known in Japanese as "Dewa Sanzan" have been the object of worship for centuries. The 3 mounts are Haguro-san, Yudono-san and Gas-san. 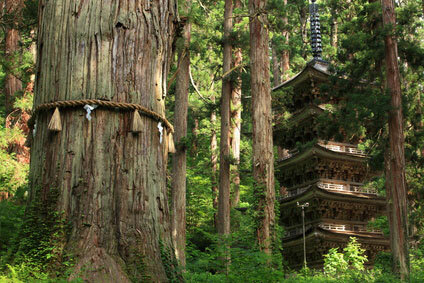 The area is a major pilgrimage destination for the yamabushi (mountain priests) and followers of the Shugendo sect. The Dewa Sanzan are located in the center of Yamagata prefecture, between Tsuruoka and Yamagata city. Haguro-san is less than 15km away from Tsuruoka, but the other two peaks are some 20km south from it. It is possible to visit the three peaks in a long, hectic day, but it is advisable to spend a night in one of the numerous shukubo (temple lodging). Mount Haguro (414m) is the smallest of the three and buses go as far as the summit, although you should walk the 2,446 stone steps, as it isn't very strenous and takes less than an hour. 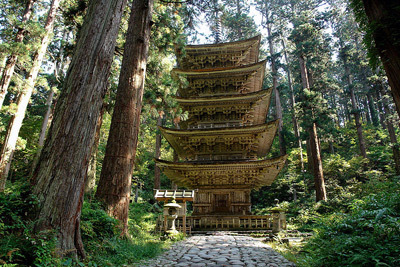 On your way, you will pass a 600-year old wooden Five-Story Pagoda (五重塔, 'gojunoto') built without a single nail. 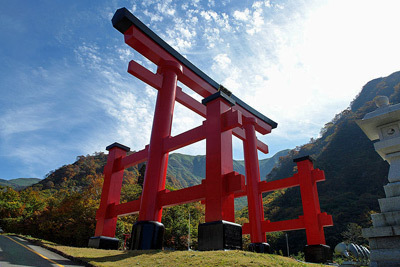 The summit of Mount Haguro is defined by a shrine and torii. 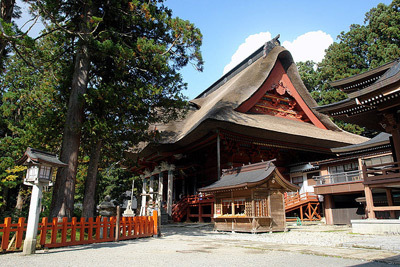 The main attraction is the Sanzan Gosaiden Temple (三山合祭殿), venerating the spirits of all three mountains. 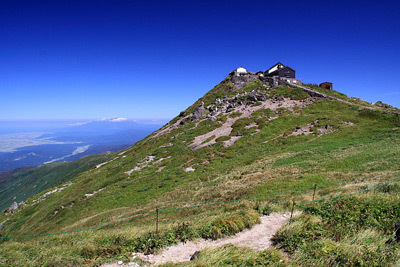 Gassan (1,984m) is the heighest of the three peaks. Buses drop passengers at Gas-san eighth station (月山八合目, Gassan Hachigome, ~1400m). From there it's a fairly easy two and a half hour hike to the summit, passing through the Midagahara Alpine plateau and 9th station. The Gas-san Shrine stand on the peak itself (entry ￥500). Mount Yudono (1,504m) is another two and a half hour walk. The first 40min descend, then it is a steep hike up before reaching Yudono-san Shrine (湯殿山神社), the holiest of the three, although it is just a big rock and a torii. Yudono-san can also be accessed via the three km trail from the Yudono-san Hotel to Senninzawa. Yamagata prefecture is home to a rarity known in Japanese as Sokushinbutsu or Buddhist Mummies. These are monks who have meditated while fasting for years until death resulted from it, their body having lost most of their flesh and become "mummified". The Dainichino Temple on Road 112 between Tsuruoka and Yudono-san has one of these sokushinbutsu in display. See this page for more information. Buses connect Tsuruoka to Haguro-san (40min, ¥660) about every 45 minutes between 6:30 am and 8:00 pm. Some buses continue to the top of the mountain (Haguro-san-cho) and cost an extra ¥310. It is less easy to reach the two other mounts as buses to Yudono-san Hotel (the nearest stop) only run 4x a day and only from June to early November. The journey takes 80 minutes and cost about ¥1,500. Watch out that the last bus leaves Yudono around 4:30pm. Double-check the timetable when you arrive so as not to be left stranded (well at least there is a hotel at the bus stop). Tsuruoka is some 4 hours 15 minutes from Tokyo by train, using the shinkansen to Niigata, then the JR Limitied Express Inaho. The nearest airport is Shonai, 40min by bus from Tsuruoka (flight to and from Tokyo Haneda only).